The Skeptic in the Room: Curiosity Wins; Science Takes Silver; Mankind Takes Bronze! Curiosity Wins; Science Takes Silver; Mankind Takes Bronze! I will be, I'm sure, only one of thousands who will take to the Internet today to heap praise on the brilliant scientists and determined bureaucrats (yes, even them!) 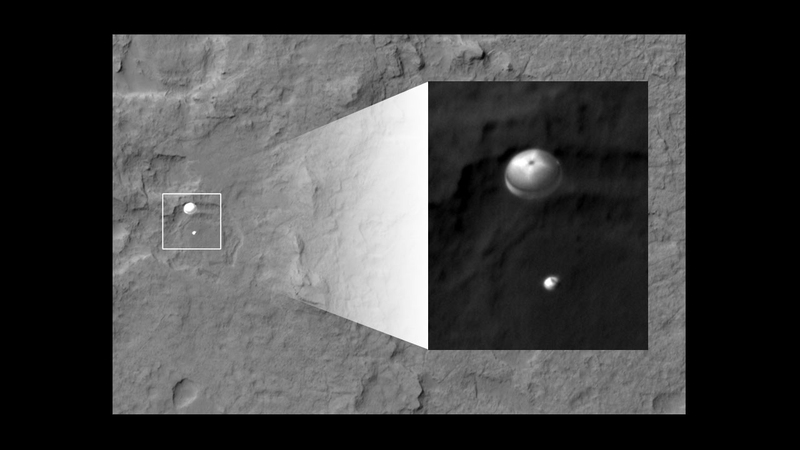 who made last night's apparently flawless landing of the Curiosity Rover on the planet Mars a reality. As a non-scientist myself I have nothing to add to the technical musings of those are in a position to explain these things. But, precisely as a non-scientist I stand in awe of those who could make this happen. Dropping a one-ton Rover onto the surface of a planet that is over 100 million miles away? Doing it precisely on time and exactly where they wanted to? Capturing photographs of the landing by maneuvering another already-in-place Orbiter into exactly the right position in space? All of it boggles the mind! Who can imagine such things, let alone carry them out? I can't really comprehend what all of this means for science. Sure I understand the goal of searching for past signs of life on Mars, and I really can't wait to see what they find (although, really, I just can't wait to see more high definition color photographs from freakin' Mars!). But knowing they were able to pull this off just makes me believe that much more in the power of man's ingenuity, creatively and, yes, curiosity. "When we reach, when we explore, when we’re curious – that’s when we’re at our best. We can learn about the world around us, the Universe around us. It doesn’t divide us, or separate us, or create artificial and wholly made-up barriers between us. As we saw on Twitter, at New York Times Square where hundreds of people watched the landing live, and all over the world: science and exploration bind us together. Science makes the world a better place, and it makes us better people." I love the movie Apollo 13, and always get teary-eyed in that scene when the capsule finally reappears and the room full of exhausted scientists erupts in jubilation. And last night, watching the live NASA feed, I got teary-eyed again seeing that moment reenacted in real life and in real time. Truly awesome!